A new year means evaluating personal and business goals, and what better resolution can you make than to your health? 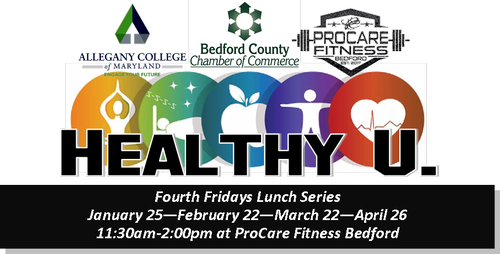 The Chamber is proud to offer a HEALTHY U. lunch series to open 2019, in partnership with Allegany College of Maryland and ProCare Fitness Bedford. Attendees may register for any or all of the lunch programs; participation in the entire series is encouraged to reap the greatest benefit for individuals as well as for area businesses. Business benefits of healthier employees: by supporting a healthy workforce, businesses improve productivity, cut down on sick days and can even lower medical and insurance costs. Helping Your Health: Are you confused about what to eat for the best benefit of your body? During each healthy lunch session (11:30am-2pm) at ProCare Fitness Bedford, guests will have the chance to hear from ACM Professor and Nutritionist Kathy Thompson about a variety of valuable topics, like understanding labels, brain health, gut health and much more. Added Activity: Do you have trouble making time for exercise? ProCare Fitness Bedford Owner and Personal Trainer Blair Leydig will offer useful tips to help you get moving in 2019 as part of each HEALTHY U. session. With the opportunity to participate as much or as little as your comfort level allows, Blair will show us exercise options for many lifestyles and fitness levels. Value Added: Would you like to measure your progress? In addition to great information from knowledgeable experts, ACM nursing students will provide an added benefit for attendees: (private and confidential) checks of height, weight blood pressure, heart rate and respiration, allowing participants to track vital statistics over the four month program. The student participation is a win-win, with value-added benefits for registrants and real-world experience for the students. Additional Take-Aways: What long-term benefit will this program offer? Those who participate in the HEALTHY U. lunch series can expect to leave the program with hand-outs from each session as well as a personalized nutrition program and personalized fitness program, based on individual needs, goals and lifestyle factors.